The site of the Fukushima nuclear disaster in Japan remains a post-apocalyptic landscape of abandoned towns, frozen in time. Science correspondent Miles O’Brien got a rare tour inside the plant, where three nuclear reactors melted down after the earthquake and tsunami in 2011, to learn more about the long-term solutions for stemming the radioactive contamination. Syria: Vision of Mankind’s Future? It is a vision of unimaginable desolation: a crowd of men, women and children stretching as far as the eye can see into the war-devastated landscape of Yarmouk refugee camp in Damascus. 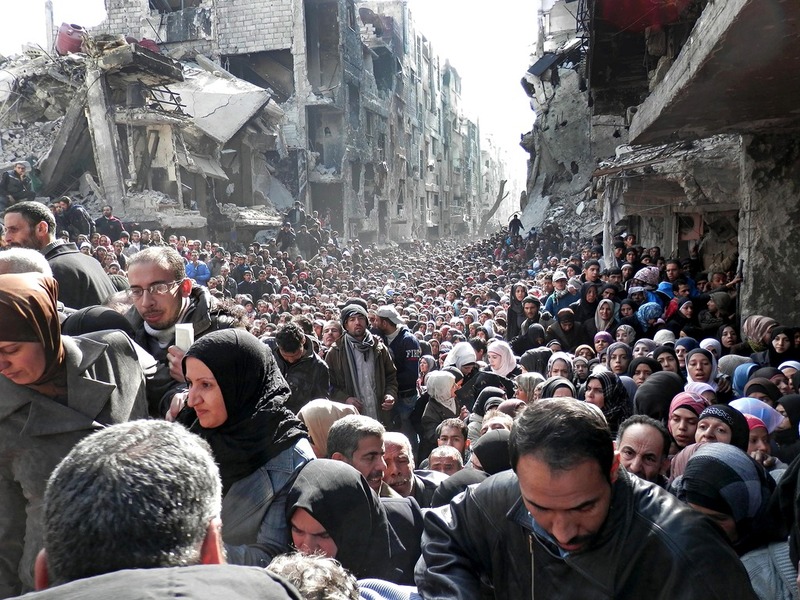 A photograph released on Wednesday by the UN agency for Palestinian refugees, UNRWA, shows the scene when thousands of desperate Palestinians trapped inside the camp on the edge of the Syrian capital emerged to besiege aid workers attempting to distribute food parcels. More than 18,000 people are existing under blockade inside Yarmouk, enduring acute shortages of food, medicines and other essentials. Much of the camp has been destroyed by shelling, and attempts to deliver aid to those inside have been hampered by continued fighting in Syria’s three-year-old civil war. SAN FRANCISCO — Drought was a key factor contributing to unrest and civil war in Syria, and the severity of the drought was probably a result of human-caused climate change, new research presented here Monday (Dec. 9) at the annual meeting of the American Geophysical Union suggests. The study analysis suggests that the drought was too severe to be simply a result of natural variability in precipitation. WUWT: Why Didn’t the Bible Mention Blizzards? Let me emphasize I would not know about this if someone had not pointed it out to me. Posted the other day on the science denial blog Watts Up With That. Which now brings me to the decisive point: while the proponents of the theory of catastrophic anthropogenic global warming (CAGW) insist that the temperatures of the planet are set to rise in an accelerating mode that we won’t be able to control least we adopt drastic climate protecting measures a.s.a.p., we just learn that in the Sinai desert, a region to the south-west of Israel, four hikers have died in a blizzard. They lost their way and sadly froze to death in deep snow at temperatures well below the freezing point. Pictures in the internet show camels knee-deep in snowdrifts. If one pieces together this information and biblical records, one might feel entitled to draw the conclusion that such a weather event hasn’t been observed in the region for several thousand years. Not exactly an indication of runaway temperatures, at least not a rush to the northern regions of the mercury scale. And this wasn’t a singular event. Over a prolonged time period and a wide area, the Middle East might have been experiencing its worst cold snap in several hundred if not thousand years. Good discussions this week on the topic of new paradigms for utility grids and energy storage. I’m reposting Don Sadoway’s TED talk from 2012, because he has a promising technology for energy storage – that has continued in development by the startup Ambri. Tech heavy stuff. Excerpts here – more details at the link. Experts weigh in. The three layers in the Ambri battery are self-segregating, cheap to manufacture and earth-abundant. The materials used in the original design were magnesium and antimony separated by a salt — but “we needed higher voltage and lower temperature,” said the CTO, and so the firm has a new, undisclosed chemistry arrived at with the help of ARPA-E funding. You wouldn’t know it if you got all your news from Fox & Friends, but January was, globally, one of the warmest in the instrumental record. Interestingly, this report, based on NOAA data, says January was the “third wettest” in the record, whereas the UK Met Office says the month was the wettest in 248 years, since records began. I give the Met Office the edge on that one. Both Dr. Hubbard, and my Dark Snow Project cohort, Sara Penrhyn Jones, live in Aberystwyth, on the coast of Wales, and teach at Aberystwyth University. I skyped with Alun a week or so ago in the midst of the storms hammering the area. Shortly after that he wrote me to explain that his roof had just blown off in hurricane force winds. Sara was kind enough to shoot some video of the surf pounding the area, and she caught up with Hubbard long enough for a colorful and well informed take on a sentinel weather event.